When you apply for food stamps, your household must meet Food Stamps Income Limit tests as one of the qualification guidelines unless all members of that household are receiving TANF, SSI or in some states general assistance. 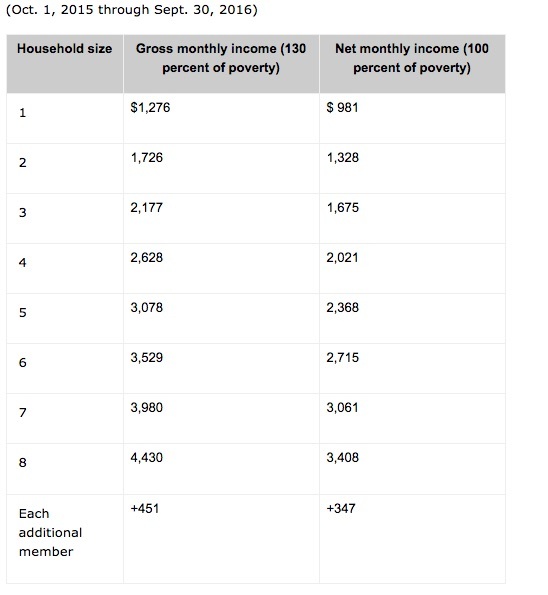 The income limits has both gross monthly limits and net monthly income limits. The gross limit is based on 130 percent of the poverty level (may be high as 200% in some states) and the net income limit is based on 100 percent of the poverty level. Most households must meet both the gross and net income tests, but a household is exempt from the gross income limit if there is an elderly person living in the house or there is a person in that household receiving certain disability payments. If your household has income above the limits below, you will not be eligible for Food Stamps unless you fall under the exceptions outlined above. Here are the limits for the period October 1, 2015 – September 30, 2016. The amount of food stamps you receive depends on the net monthly income of your household and the number of people in your household. Click here to see the chart for food stamp allocation based on household and net income.